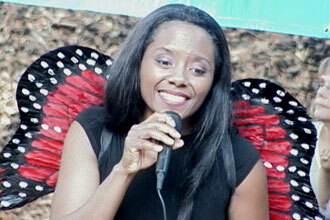 If your event has an insect, sea creature or bedtime/nap-time theme, then Sandi & Stevie may be the perfect choice. 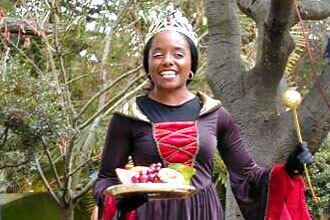 Sandi & Stevie can perform their award winning Insect Songs, Sealife Songs or Sandi Sings Bedtime Favorites children's show at your preschool, birthday party, library, summer camp, private gathering or public event anywhere in the Bay Area. Perfect for children under 8, Sandi & Stevie's interactive shows are fun-filled, educational, environmentally conscious and creature friendly (Sandi & Stevie never take any live creature hostage). Using a combination of humor, fantasy and reality, Sandi & Stevie help teach kids about the habits and importance of our creature friends, encouraging us to live in harmony with them. Desired Results Developmental Profiles (DRDP) measures designed by the California Department of Education. 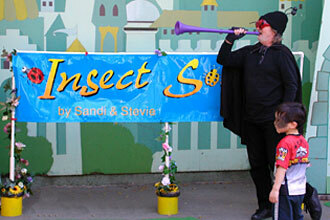 Sandi & Stevie perform their Insect Songs at Children's Fairyland. Children march in time with the Marching Ants, hop! hop! hop! with the Green Grasshopper, learn the infamous Itchy Itchy Flea Dance and buzz, fly & zoom around with the insects as Sandi & Stevie sing and perform The Greedy Wasp, Zzzooming Everywhere and Beautiful Butterfly. Sandi & Stevie perform their Fall Into Autumn concert at the Crow Canyon Gardens in San Ramon. After enjoying a high-energy, interactive show, Sandi brings the unique day to a close by singing the beautiful Disney-like Insect Carnival. 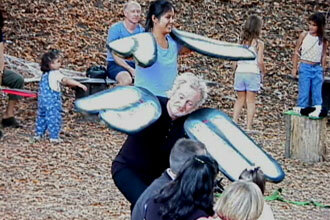 An insectuously good time was had by everyone as KPIX Channel 5 recorded the concert for a segment on Evening Magazine.